Miracles and magic and dreams come true cannot describe our joy. With radiant smiles and sparkling hearts we welcome our little BOY! 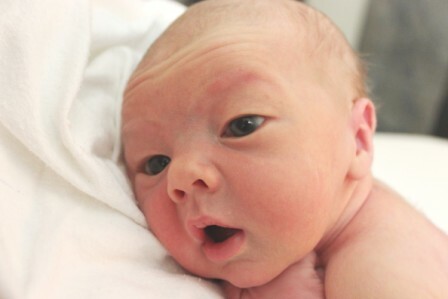 Everything went just perfect for the natural birth of Landon at the Birthing Center. Before going to the birthing center I was home with mild contractions throughout the night and woke up to make a yummy green smoothie. While I was in the kitchen, my water broke and immediately intensified my contractions. It was time to head to the birthing center! Yeahhhhhhh! I had a team of people supporting me including my wonderful husband, sister, my mother, 3-4 Midwives, my doula Nicki Ryan, and brother in the waiting room. I never took any pain medicine or epidurals, just natural laboring in the birthing-tub, sitting on a physio ball, standing/walking, and on the bed. My Doula Nicki was amazing! For those of you who may not know what a doula is, she’s a coach and support for the mother. She was by my side for the entire 9 1/2 hours of labor, encouraging me, pressing on my back to lessen the labor pains, and anything else to help me be more comfortable and help progress labor along. I would not have done as well as I did if it wasn’t for her support, thanks Nicki! After 9 1/2 hours of labor, Landon was born and the midwives and our doula commented on how alert, calm, and wide-eyed he was. After Landon laid with me for about 10 minutes and allowed the placenta to continue to feed Landon every last drop of blood and oxygen during his transition, Mark cut the umbilical cord. Once baby & I got some bonding time and a chance to recover from the big event, Landon successfully fed to my delight. The loving and powerful women who were my birthing team gave him an exam and yep, he’s incredibly healthy! 4 hours after Landon was born, we headed home to sleep in our own bed that night! All of the horror stories and challenges that people loved to share with me along the way, I didn’t experience at all while Pregnant. In fact, I felt soo good, I kept training my clients all the way up to week 40, full term. My lovely clients begged me to please rest and take it easy, thanks guys! It was nice to relax for the big day. I feel the work I did pre-pregnancy, like testing and cleansing, and using all the powerful principles I have learned from years of education and experience during my pregnancy made all the difference in having a pleasurable pregnancy and delivery. 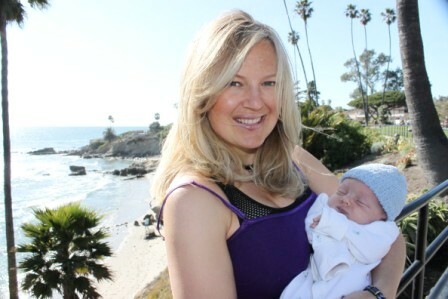 During my pregnancy I also worked out 4 hrs a week all the way up to week 40, 2 hrs of weight training & 2 hrs of cardio, no silver-bullet or shortcuts, only the best for baby and me! It wasn’t easy some days when I was yawning up a storm but about 15 minutes in to my workout, my energy kicked in. Yesterday at my 2 week exam, I weighed in only 10 lbs from my pre-baby weight. I had gained a total of 31 lbs. during my pregnancy so I’m down 21 lbs already! Woohoo! Thanks soo much for keeping us in your hearts and thoughts during this time, we totally felt the love. We can’t wait to do his first video! OMG he is sooooo cute, wow, i can see you in him for sure! Gamerchanger I’m sure for you both….We wish you a lifetime of amazing Family memories New Mommie, man is that kid sooooo lucky to have you as a Parent! Thank you! Mark & I feel so blessed and can’t wait to share soo much with Little Landon including how to live a healthy and active/fun lifestyle! I am very happy to hear about that. May God bless your son and family with good health, love and happiness always. Thanks so much! we are excited for our new adventure in life and our new family. Thanks Patrick! We are a happy family! I’ll probably do a how to have a healthy and fit pregnancy.